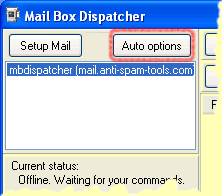 Use auto-options to start auto-destroying all spam incoming traffic. MBD has built-in email cache, so its monitoring ability is very fast and don't eat more of traffic! - Play Sound. This option plays sound when your mail boxes have new messages after last checking. - Report by hint window of tray icon. This option use tray icon to report about last checking status. - Play sounds for friend's messages. This option activates all sounds which you specified in friends tab of auto-selection rules. 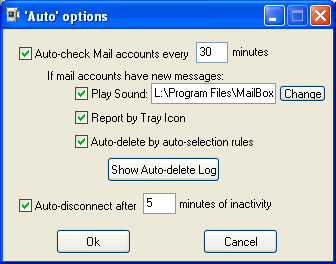 Click Show Auto-delete log to see info about auto-deleted messages. Check Auto-disconnect after x minutes of inactivity and MBD will be auto-disconnect your connection if you close or hide MBD window, but forgot to finish connection. Copyright © 2003-2006 Alex Kaul . All rights reserved.